Strong leaders recognize that Leadership is all about associations and interactions. Resilient and strong leaders are creators. They motivate, compliment, guide, in addition to stand on the side. These people create, examine, strengthen, promote, and stand in the back. Indeed, from time to time they stand in forefront, too. Leaders fully understand that it is their accountability to help build an environment specifically where everybody can succeed and each and every individual can prosper. 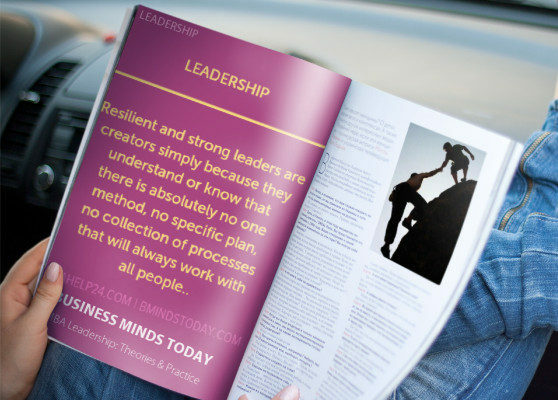 Resilient and strong leaders are creators simply because they understand or know that there is absolutely no one method, no specific plan, no collection of processes that will always work with all people or, perhaps, will always work with any one individual. Each and every unique scenario is required to be valued. Concept, Definition & Justification Of Leadership ? Leadership & Management: Key Differences ?